Don't let that sneaky sun try to trick you. Wind chills as low as 25 below zero are predicted for the day. I must say, I'm feeling a little bit tough in my military-inspired get-up. But don't let that deceive you either. I went right back inside and intend to stay put! I know a lot of places are experiencing brutally cold weather right now, so stay safe and warm! love those boots! nothing like feeling strong and sassy. so cute, I love your tshirt dress and denim leggings! I love it all. Those boots look brand-spanking new! Amazing find. I hear ya girl, this cold is for the tough skinned! it is so miserably cold here in kansas! !, but at least you manage to look cute and warm. i have that same green jacket and haven't thought of wearing it in a long time. you have inspired me to try it! thanks and stay warm!! ugh jealous of the boots!!! so cold- i was crying ab the damn nyc weather! YOU WIN!! lekisskiss.blogspot.com <-- 2 girls bloggin fashion from nyc and chicago! i hope you don't mind being called cute because the first thing i thought when i saw this post was, "CUTIE PIE!" Ugh, yeah it's 30 below here, too. I didn't even go to work because of the roads. Send me some snow. It is cold here they predicted snow in Georgia but nothing yet just some flurries. I am trying to stay warm though. Love your boots. love the military jacket, stay warm! It looks so cold!!! Good for you for going back inside... I would've done the same! LOL! I can't believe I just found your blog! I saw you Lucky and thought you were pretty awesome. You are amazing and inspirational, don't listen to anyone who tells you otherwise! ps - the sunglasses look cute with your hair! You look so cozy! Love this look. I want some military boots of my own! I'm jealous of your hardcoreness. I also am jealous of situations that you encounter in which it is both sunny and snowy. 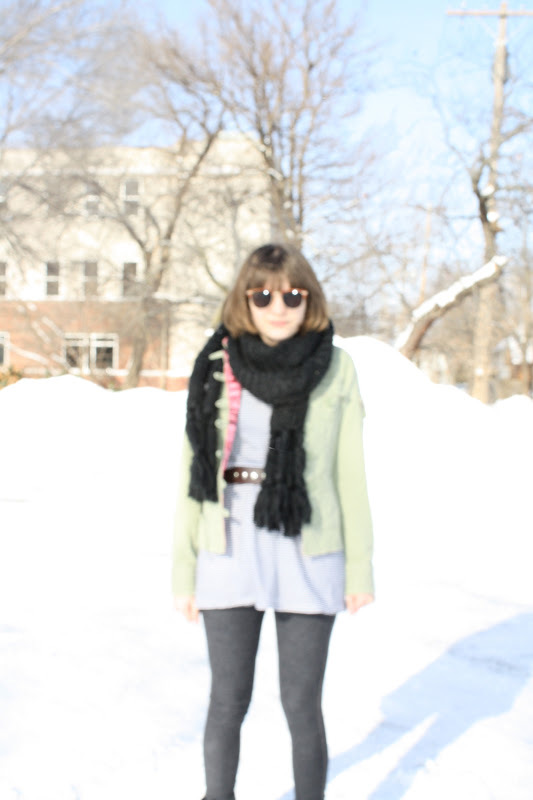 I haven't experienced this in Texas and I think I would love to wear sunglasses in the snow. yikes! i've never felt that kind of cold before. Despite the weather, you look awesomely nonchalant and unaffected by it. i think i'd be crying icicle tears. You find the most amazing stuff @ Goodwill! So jealous of the boots! you look so cute, but i can see the cold in your face! grrrrrrrr midwestern winter! I have that coat and had forgotten about it until pretty recently. Love the style and the pink satin inside. You look great! I think I own most of that outfit. Awesome!